A repository for articles and artifacts regarding the intriguing history of Jews in Latin music. THE MAMBONIKS began in 2001 as research for a book that remains unpublished. I hope that sharing my interviews and materials will help broaden the understanding of this unique moment in Jewish cultural history. Sidney Siegel parlayed a ghetto jewelry store into one of the largest independent Latin record label of the ‘40s and ‘50s. 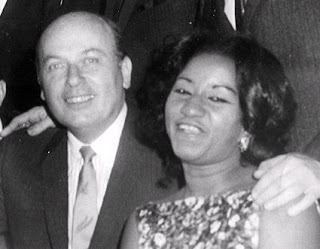 Promising “The Finest in Latin American Recordings” on every disc, Seeco Records delivered stars including Celia Cruz and La Sonora Matancera not only to the U.S., but to Puerto Rico, Cuba, Guatemala and Japan. It all began in a bombed-out building at 115th St, in the Spanish Harlem that until recently had been the second largest Jewish community in the country. Siegel’s father-in-law gave Sidney a building at 1393 Fifth Avenue as a wedding gift. Once one of the tonier areas of the neighborhood, it had fallen on hard times. The upper story, an apartment house, was condemned. But the ground floor was perfect for a shop, and Sidney opened Casa Siegel -- the House of Siegel -- in 1941. The store stocked low-cost furnishings, as well as jewelry, radios, and records. Howard Roseff, Siegel’s younger cousin, worked alongside him in the store as a child, and eventually became Sidney’s right hand in Seeco. Casa Siegel’s clientele was mostly Puerto Rican, and returned often to purchase music from the shop’s selection of 78s, which included island music as well Argentine tangos, Mexican music, boleros, and Cuban rumbas. The early ‘40s were a time of upheaval for American recording companies. First, a broadcasters feud with music publishers sparked a scramble for publishing rights, as hundreds of folk, blues, and international music compostions were bought up by American houses. Then, the American Federation of Musicians went on strike, resulting in a recording ban that kept the best bands out of the studios for over two years. When the United States entered World War II in December of 1941, non-essential industries, record manufacturing among them, all but shut down. Remembers Howard Roseff, “Part of the rationing was that one of the components of making records, shellac, was necessary for ammunition.” In fact, the War Production Board cut shellac production by 70% in April of 1942 and suspended the production of phonographs. Seigel was keenly aware of the resulting music shortage, but also noted how the Latin music he sold from his shop had an insatiable market. When major labels began to release their Latin stars from contracts, Seigel snapped them up. Seeco began recording in 1944. Some of the earliest sessions were with Pupi Campo and Noro Morales, two Barrio bandleaders who specialized in Xavier Cugat-style music. Campo in particular wooed the Jewish crowd, and when television hit, he was a regular on Jack Paar’s show. But by and large, Seeco catered to the tastes of Spanish Harlemites first. “Our market was Harlem,” Roseff recalls, “but we did a lot with Puerto Rico and Cuba, and then we eventually wound up in Guatemala and Panama.” Such practices were common for major record labels, but for an East Harlem independent, Siegel’s ambition was notable. Throughout the ‘40s and ‘50s and into the ‘60s, Seeco and its subsidiary Tropical, manned by Howard Roseff, specialized in a wide variety of Latin music, including tangos, Mexican rancheras, Dominican merengue, Spanish flamenco, and more. In 1954, Seeco pressed the first Latin twelve-inch LP, while 10-inch 78s would continue to be a staple of the Latin market into the ‘60s. The momentum kept the label near the top of the heap through the mambo era. In 1953, Variety ranked Seeco second behind the giant RCA in the surging Latin music market. But Seeco couldn’t keep up with the New York Latin sound being created by Tico and other competitors, and lost Celia Cruz and Vicentico Valdez in 1965. At the same time, Seigel was named in a series of royalties-related lawsuits. Says Roseff, “Paying royalties at the time was not too important to people who were just concerned with getting the project out…Not to besmirch Sidney, but he was a businessman and you try to get away with whatever you can, and when you get caught, you pay.” Siegel sold the business in the late ‘60s only a short time before he suffered a fatal heart attack. The Seeco example inspired others in a golden age of independent Latin record labels. Alegre, Verne, Mardi Gras, Tico, Ansonia, SMC, and Fania were just a few of the players in the Latin biz who took their cues from this dapper Jew.